Throughout her lecture, she raised pertinent questions and shared her thoughts on some of the most topical intellectual property issues from an African perspective. For example, she addressed the question of how accessibility to works produced at publicly funded research institutions can be increased for the public good, and how works created by indigenous communities can be protect adequately. And repeatedly, Professor Ncube referred to her research work carried out projects such as Open AIR and ASK Justice. Professor Ncube began her lecture by explaining some of the basic concepts behind intellectual property protection, and she repeatedly used easy-to-understand everyday examples to showcase how relevant intellectual has become for all of us in our daily routines. 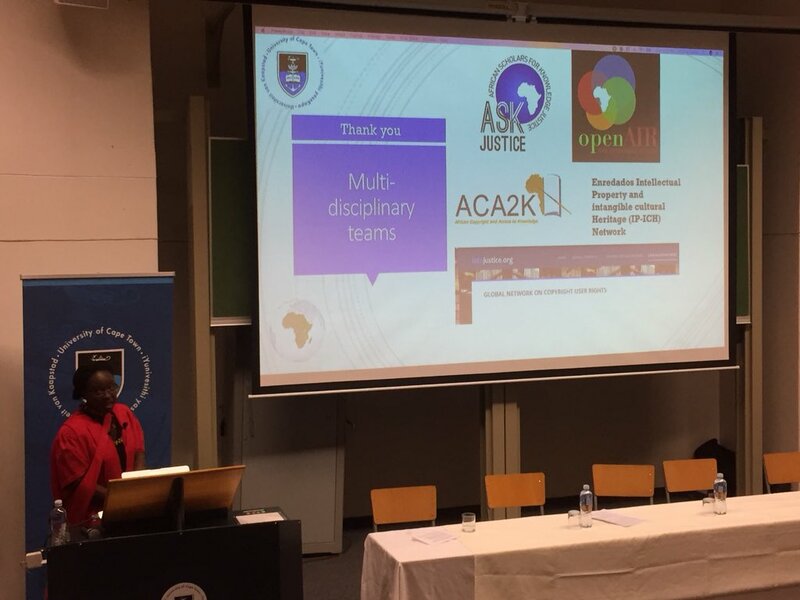 Professor Ncube then explained to the audience that a large part of her research has focused on indigenous knowledge, and the question of how such knowledge can be protected so that communities from which works are derived receive an equitable share of the benefits. While there are various ways to protect indigenous knowledge, Professor Ncube argued that in her view the best solution was a tailor-made system inspired by the indigenous community’s own knowledge governance system and its ideas of communal creation. One key aspect of Professor Ncube’s lecture was that apart from protecting private property rights, intellectual property regimes have an important public interest role to play in assuring equitable access to, among other thing, culture, medicine, and educational material. Honing in on the meaning of “public interest”, Prof. Ncube has argued in her writings that the public interest for each country is what has been articulated in the country’s constitution, laws, policies and strategies. Thus, intellectual property is never a one-size-fits all approach that can be applied in the same way in a number of countries. Hence, while there are shared concerns across the continent, each country must ultimately create laws custom-fit to its own socio-economic conditions. It was evident that a key concern of Professor Ncube’s research work is the safeguarding of equitable access opportunities with regards to intellectual property protected works. Access to affordable textbook and other learning materials, for instance, is key for enabling education; however, as shown by Professor Ncube’s research, copyright can significantly limit such access. It was clear from the long applause at the end of the lecture that the audience was as impressed as her family, friends and colleagues were proud. And all of us at the IP Unit wish to congratulate Professor Caroline on what can only be described as a remarkable inaugural lecture from an outstanding academic. The video of the inaugural lecture is available here.